Congratulations, you have an iPad. This sleek Apple device took a hunk of money to purchase, but now you get to look forward to buying tons of accessories! Of course, that’s so long as you remember to bring them with you. You can buy a bag that will accommodate your tablet, cords, and add-ons, but that’s going to be pretty costly as well. Wouldn’t it be better to just get something that will attach like a Smart Cover and keep everything all tidy and together? The Smart Cargo is a little carrying case for your essential iPad needs, and will stick on just as firmly and securely as your Smart Cover will. 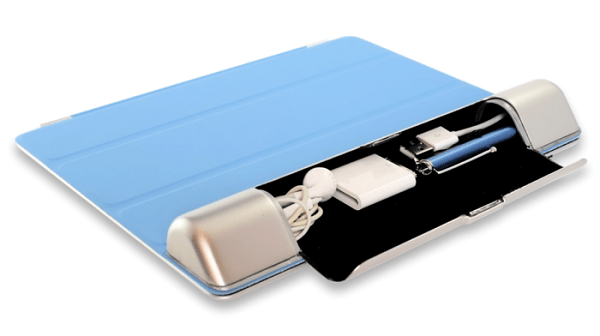 Its metal exterior will keep your headphones, adapter, stylus, and charging cable all safe in the felt interior. This can also function as a carrying ‘handle’ of sorts for your iPad, and could be used as wrist support while typing. As it it quite compact, you’ll be happy to know that it won’t inhibit any of your Smart Cover capabilities. Putting down $20 will get you one of these, but don’t think that will spare you from wanting more accessories.